The IdolMaster is a Japanese console game, wherein you 'the producer' working for 765 Production studio with a selection of ten possible pop idols with the aim at creating a winning pop group (correct me if I am wrong, I have never played the game as it is in Japanese). 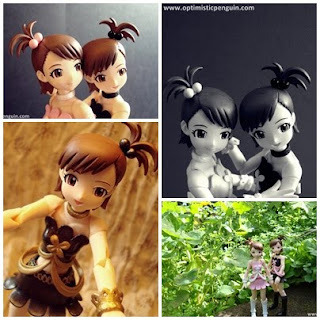 Ami and Mami Futami are 12 year old twins who enjoy doing impressions and teasing their friends, Mami although born after Ami is the more mature of the two however it is Ami’s name which they perform under. The twins are completely identical save for the fact that Mami ties her hair to the left, while Ami ties it to the right, they use this to their advantage and switch hair styles so that they perform as one person, and only the council of their production studio know that they are in fact twins. This Mami is the Gothic Princess edition. 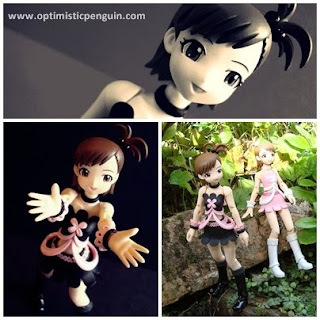 Mami’s sculpt is very girly, she is slender with a small almost flat chest giving her a very young and childlike appearance, which is very like her play station game counterpart. Her design is very simple, with plain hair and simple costume, but she is very much like her character so no complaints. Her sculpt is very good like all the Fraulein, only complaint would be that the joint in her upper thigh looks a bit unnatural and odd, but this was changed in the later releases of the Fraulein line. I chose the Gothic Princess edition as I thought it would be nice as I have Ami her twin in the Strawberry Snow edition that I’d have Mami in the Gothic Princess edition, just so I don’t have to identical figures. She is well painted, but as her clothes design is simple and straight forward she is painted in solid colour with no shading, but as her clothes are not designed with creases and ruffles this is fine. Her skin is pale but nice. The paint on her face is nice. Her accessories are nicely painted, her cow bell is shiny gold, on her demon feet there is some paint rubbing of the dark blue on the lighter blue, but not noticeable unless up real close. Mami uses the E.L.F joint system, which is used by all Fraulein Revoltechs. Her neck has a Revoltech joint, so she can look up and down and side to side, however she can’t really look back due to her hair. At her bottom/top of her thigh she has a Revoltech joint that moves forwards, but not backwards or side to side. Half way down her thigh she has a swivel joint so her leg can turn in and out. Her knee is a hinge joint, giving her a natural movement of knee going backwards. Lastly at her feet she has a Revoltech joint allowing her to point and flex, and can turn in and out, in and out movement somewhat restricted by her boots though. Mami comes with the standard Fraulein Revoltech stand, which is black and has her make (Fraulein Revoltech), her name and the series she comes from written on the base. 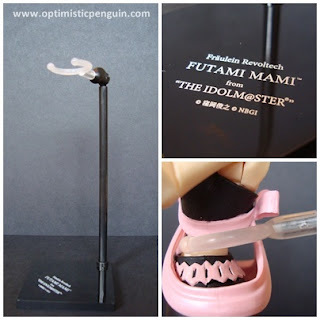 The stand itself consists of a base a pole which pegs into it, and then a two jointed Revoltech Joint, which goes in the top of the pole and then into a U shaped holder. The thing to note about the Fraulein Revoltech stands is that they are too tall for the characters, and so when in the stand their legs dangle in the air, which is rather annoying at times. 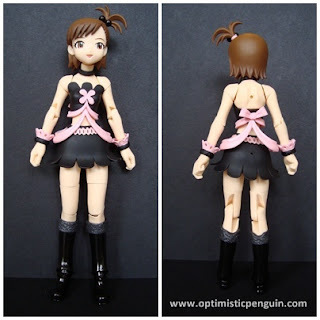 Mami comes with the standard Fraulein box, with a window at the front, a picture of her posing on the side, on the other side details and pictures of the E.L.F joint system which the Fraulien Revoltechs use, and on the back pictures of her accessories and some of the poses she can do, and other info, on the bottom of the box all the authorized info, with her authorization stamp, and warning statements (all writing in Japanese). Inside the box she is held between two molded pieces of plastic, with a space for her hands. Her other accessories and stand came in plastic bags attached to the back of her casing. This is standard packaging for the Fraulein Revoltech line. Also take note of the authorized sticker, each figure should have one. 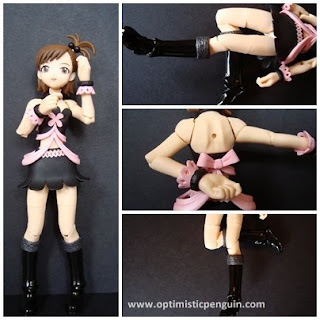 Mami comes with a cow bell, a policewoman’s hat, demon feet, and cat paws. She also has three pairs of extra hands. 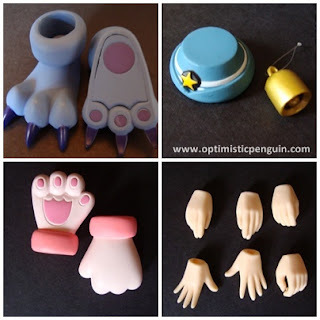 The demon feet and cat paws are particularly awesome. Only thing to note is unlike the newer Fraulein releases, Mami does not come with alternative faces. Mami is a very cute figure, she is basically identical to Ami, accept her ponytail is on a different side and her facial expression is different, I got her due to Ami complaining that you can’t separate twins! 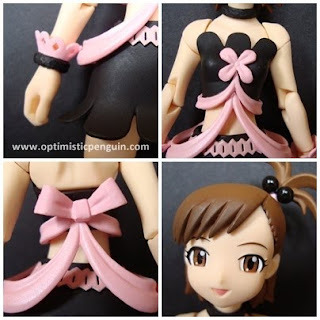 I believe if you collect all the IdolMaster Frauleins you get interchangeable accessories, as Mami has a small hole in her back to attach wings, and one in her skirt to attach a cat tail to. Over all Mami is a fun figure, she is very cute and innocent looking. I may or may not collect the rest of the IdolMaster Frauleins, as I believe all their accessories are interchangeable and that would make for added fun.